AUGUST 1--As a notorious hacker seeks to distribute “very personal” e-mails sent to Colin Powell by a female Romanian diplomat, the retired general is denying that he engaged in an extramarital affair with the woman while he served as Secretary of State, though he recently advised her to delete all their online exchanges, The Smoking Gun has learned. Powell, who served in President George W. Bush’s cabinet for four years, said that he kept in touch with Cretu, 45, by e-mail after leaving the State Department in January 2005. “Over time the emails became of a very personal nature, but did not result in an affair. Those type of emails ended a few years ago. 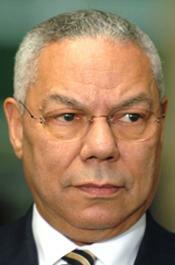 There was no affair then and there is not one now,” Powell added. Powell issued his statement (a copy of which can be found here) to TSG after a reporter sought to question him about the content of Cretu’s 2010 and 2011 correspondence, which was posted online this week. “This note responds to a series of posts placed by a ‘hacker,’” Powell wrote. While TSG did not mention Cretu (seen above) by name or refer to a possible romance, Powell’s swift denial of an affair--especially one possibly conducted with an official of a foreign government while he served as America’s chief diplomat--was clearly prompted by the sensitive nature of the e-mails sent to his personal AOL account. And likely by a desire on Powell’s part to address any appearance of impropriety, especially in light of last year’s crash-and-burn by retired General David Petraeus. 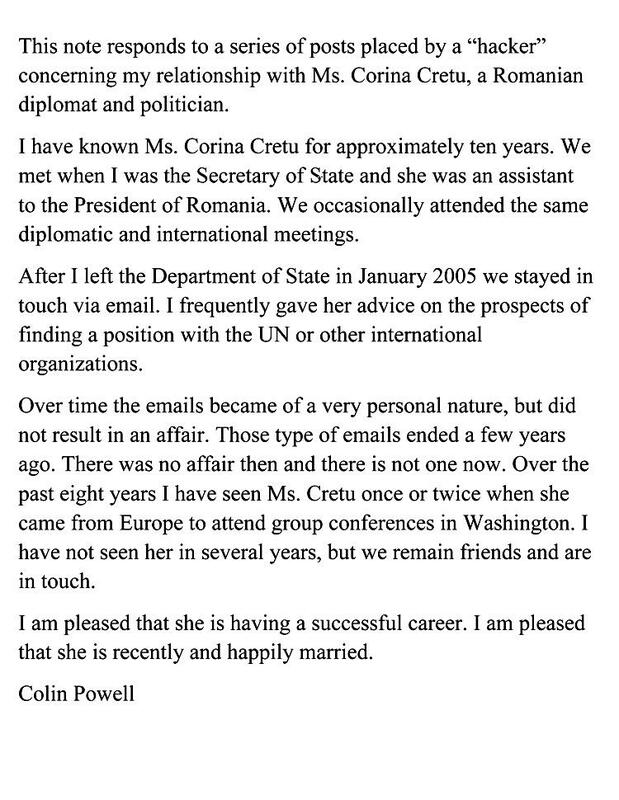 In the “very personal” correspondence cited by Powell, Cretu calls him the love of her life and describes a relationship that spanned more than a decade. The 2010-2011 e-mails would leave most readers with the clear impression that the forlorn Cretu is writing about the twilight of a lengthy romance. As reported here in March, Powell’s e-mail and Facebook accounts were illegally accessed by “Guccifer,” the hacker who has spent the last eight months breaking into the online accounts of Clinton, Bush, and Obama administration officials; former FBI agents; defense contractors; Bush family members and friends; and assorted public figures, including journalist Carl Bernstein, author Candace Bushnell, and John Doerr, the billionaire venture capitalist. Immediately after the Powell hacks, “Guccifer” sent some of the pilfered e-mails and photos to a variety of news outlets (and the anti-secrecy site cryptome.org, which posted the material). This week--four months after the online break-ins--“Guccifer” returned, like a nasty rash, to continue vexing Powell. Armed with the Cretu correspondence, which “Guccifer” apparently copied during the initial AOL incursion, the hacker uploaded 10 e-mails sent to Powell and a variety of photos to Google Drive. Then, in a bid to expose the material directly to Powell’s Facebook followers (his page has nearly 87,000 “likes”), the hacker posted a message on Powell’s wall that included a link to the Google Drive page. The posting--which was subsequently spotted by Powell’s staff and deleted--had been uploaded via the Facebook account of Merrill McPeak, a retired four-star Air Force general with whom Powell had once worked. After hacking into McPeak’s account, “Guccifer” masqueraded as the ex-general when making his post to Powell’s Facebook wall. Early this morning, “Guccifer” added a second update to McPeak’s Facebook page. It contained a new Google Drive link that led to e-mails and photos--some dating back eight years--that were lifted from Cretu’s newly hacked Yahoo e-mail account. “This was a friendship that electronically became very personal and then back to normal,” said Powell. 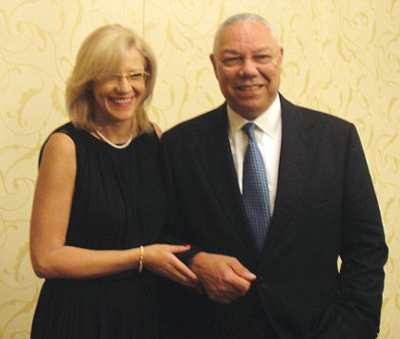 In his statement, Powell--who has been married to his wife Alma for 50 years--reported that he and Cretu “remain friends and are in touch,” but that they have only seen each other “once or twice” over the past eight years. 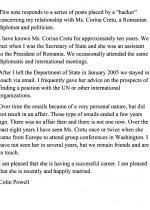 On those occasions, Powell noted, Cretu traveled to Washington, D.C. for “group conferences” that he also attended. At a July 2011 conference, Cretu and Powell posed together for a photo (as seen above) that Cretu later uploaded to her web site. 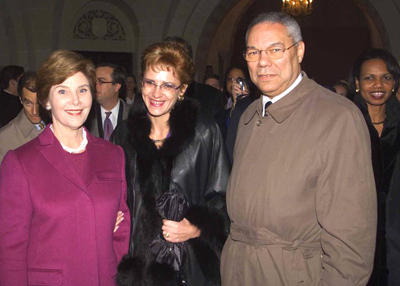 When she worked as a presidential advisor, Cretu was part of the Romanian delegation that greeted Powell and President George W. Bush when they visited Bucharest in 2002. Photos on Cretu’s web site show her with Powell and First Lady Laura Bush and Powell and Adrian Nastase, then Romania’s prime minister. 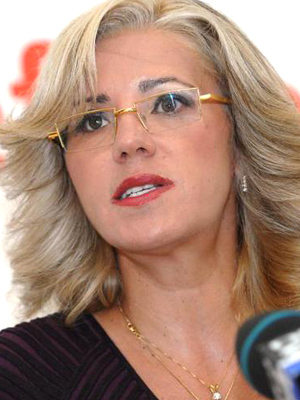 The following year, Cretu accompanied Romania’s president in meetings with Bush and Powell. In March 2004, she was part of the Romanian delegation that traveled to Washington for a ceremony, overseen by Powell, marking the former Soviet bloc nation’s accession to NATO.